I have incredibly long hair, it just doesn't stop growing! It's almost black too and I find that even if I do something nice with my hair, most of the time you can't even see it which is where these new accessories come in. I have fallen in love with these and have been alternating between them every day, it's so nice to be able to add something fun to my hair that actually stands out! 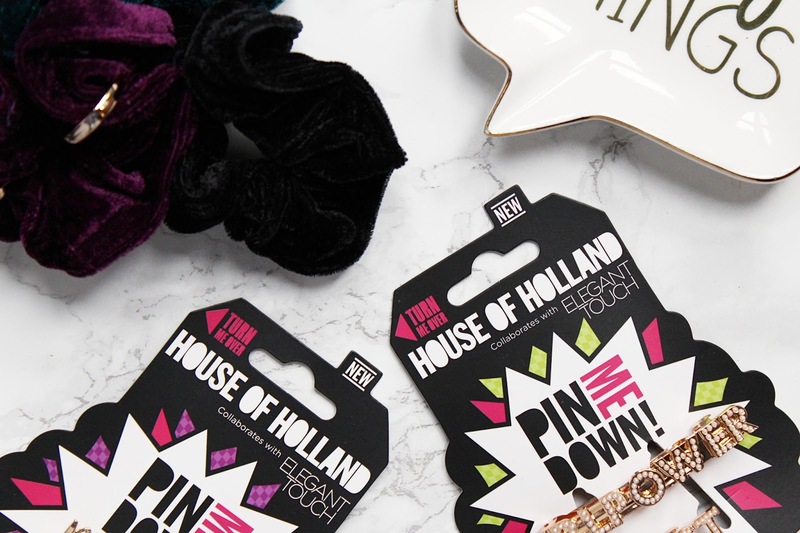 Elegant Touch and House of Holland have been collaborating for a while now, I am a huge fan of their nails and last November they launched a hair accessories range. I wrote about this range around this time last year (review here) and I really love those products and I use them all the time so when these arrived I was beyond excited. I love things to add to my hair as I really don't do too much do it, it's either in a topknot or I like to pull a little section back so these three newbies have become my best friends already. 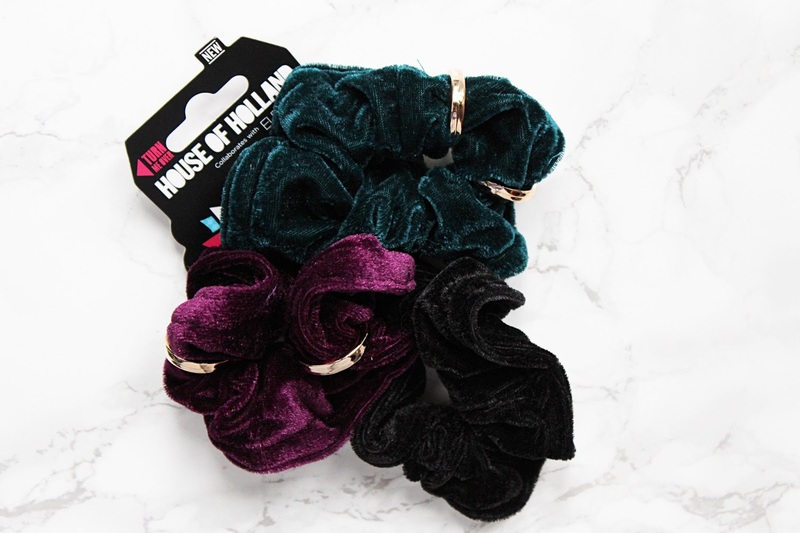 The first of the new additions are the Velvet Scrunchie Classics (£6.50). This is a pack of three gorgeous velvet scrunchies, you get a black, dark green and purple/plum and with the coloured ones having two metal coloured rings to add something a little different to them. Whenever I am at home my hair is always in a bun because I tend to pick and pull at it throughout the day and I just can't be bothered to deal with my hair most of the time because it is always in my way! These are some of the only hair bands that can actually keep my hair in a bun all day long, I have quite a lot of hair and it is super long, and I love how cute they look in my hair. I have been using these so much since they arrived, I really love the green one. I have been keeping one in my bag too so if I need to pop my hair into a quick ponytail I can do so and I have found that these don't really kink my hair either! The next two additions to the collection are both hair clips/slides and the first out of the two are the Pin Me Up Slides (£7.95). This is a pack of three hair grips/slides with a high shine finish and gorgeous gold colour. These each have a word on (Pin, Me, Up) which I have been using to pull one side of my hair back and do some small twists and I really like the little touch these add to my hair! Because my hair is so dark, these really show up in my hair and I love that about them. These feel really secure in my hair and not uncomfortable like some grips can be. 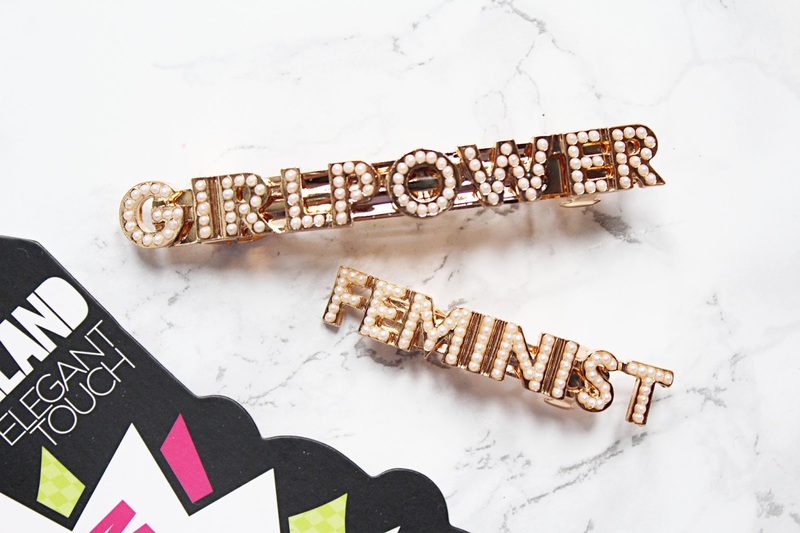 The final new products are my favourite and they are the Feminist Clips (£14.95). I am all for girl power and equality so these are a great way to show that off, even just a little bit with your hair! This a pack of two hair clips, one slightly larger that says 'Girl power' and a smaller one that says 'Feminist'. 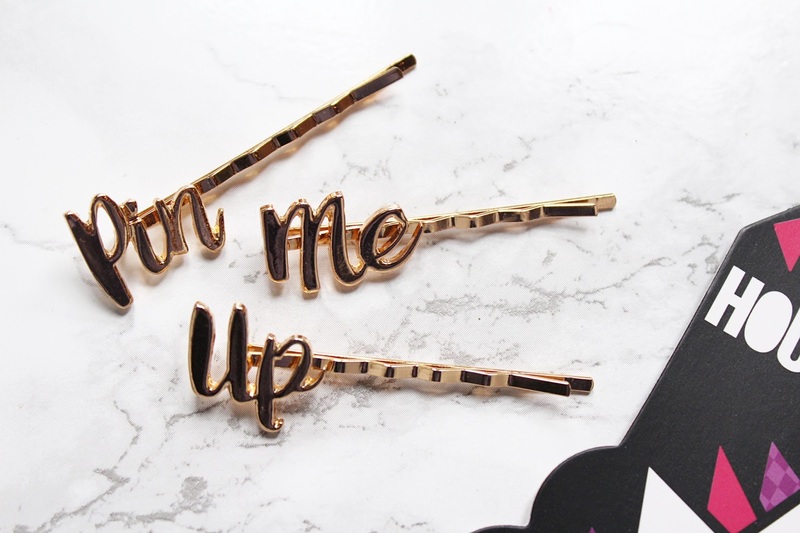 Both of the clips are gold in colour with pearl details and I have been using these most days and just like the slides, they stand out brilliantly in my hair. I used to have a side fringe that has pretty much grown out now and I have been using the girl power one to pull that back to keep this section out of my face and it just makes it look like I actually did my hair that day! These are really secure in my hair and I haven't had a single issue with them popping out throughout the day. Both of the slides and clip packs are really great quality. You can find the Elegant Touch x House of Holland products at Boots - HERE.